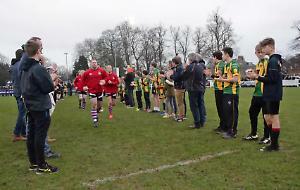 HENLEY BULLS lost out in a tightly contested clash at Bournemouth last Saturday. The Bulls started off on the back foot with Bournemouth on the Bulls line early on. An injury to Silas Pill didn’t help and soon the pressure told and Bournemouth scored and converted the first try. The Bulls came bouncing back and a break from Archie Van Dijk who fed Matthew Mann allowed Jake Lovett to score out wide. Bournemouth came backand scored an interception try to lead 14-5 at half-time. After the break the Bulls conceded a try under the posts. A clearance kick by Finn Pietersen led to a good tackle by Matt Mann on half way and a turnover by Ryan O’Neill led to him sprinting in from 50 metres. Bournemouth scored before the Bulls took control. Firstly with captain Andrew Stobbs dashing in from 20 meters before a high up and under from Pietersen was well caught by Van Dijk who ran in from 30 meters to level at 26-26. The Bulls then scored the best try of the afternoon. The move started with a good break from Pietersen which led to Mann scoring in the corner to put the visitors 33-26 ahead for the first time in the game. With a few injuries starting to appear from the Bulls, Bournemouth came bouncing back, and despite some heroic and last ditch tackling the pressure told as the hosts scored and then added a penalty. The Bulls didn’t give up, but with so many changes and players playing in new positions, Bournemouth scored again to make it 43-33.